Brown, Beige and Suede Granites have historically been very popular with customers that are trying to match with lighter brown cabinetry. 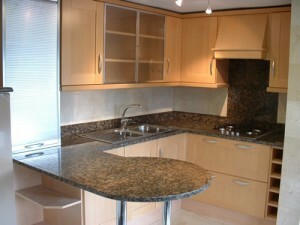 The granites adapt well to many decors but are especially well suited with an earthy style. These colors fit in well with a variety of styles and themes and the granites are known to be very durable. Whether its your kitchen or bath, the colors will give you home a warm and relaxing look. Some popular colors include Aztec, Baltic and Tropic Brown granite.